Malcolm Dragon and Battle Girl arrive at Rex Dexter’s laboratory where they come under fire from the lone robot minion of the scientist currently there. Malcolm delivers a blow to their assailant perhaps a bit too hard which leaves the robot badly damaged. The kids had sought out Robot Rex and are surprised to learn that he has gone into Dimension-X in pursuit of his creator. It was their frequent mentioning of a rescue mission that prompted Robot Rex to depart, something that could end with more problems should things go wrong. In the aforementioned Dimension-X, Robot Rex is concerned that his signal is not being detected by his ally back on Earth. The portal home does not open and he is forced to hide alongside Rex and his family on a planet populated by savage giants. Rex suggests that they plan for the worst and assume that they must find an alternate path back home. He believes that finding Mister Glum is their only chance to get to Earth. 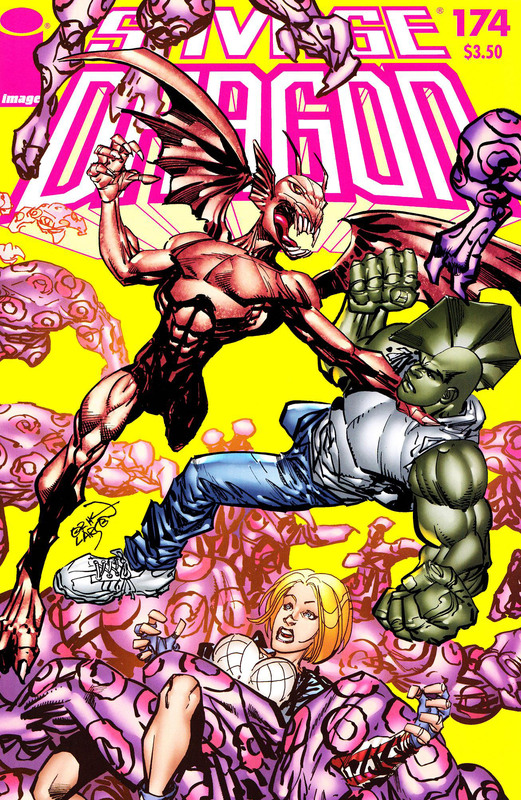 Back in Dimension-X, the giant monsters discover the presence of the hidden family and make their attack. Robot Rex flies up to intercept them, beckoning for his creator to take his family and leave. Rex notes that his abilities have all been disabled and that they will be defenseless without his robotic counterpart alongside them as protection. Robot Rex ignores this concern to bravely sacrifice himself, buying enough time for the family to get to a spaceship and flee the planet. The portal to Dimension-X alarms Malcolm and Battle Girl when the image on the other side suddenly moves. This gives the impression that they are in a vessel moving through space. The last words of the dying robot confirm that the portal has always been able to move its viewscreen, giving them access to any point in Dimension-X. The mechanism closes in on Rex Dexter’s location but ends up selecting the wrong version. The original, demonic form of Rex emerges with an army of Absorbanoids and they pass through the portal to Earth. Monster Rex notes that he is Deathseed reborn, his transformation finally completing after Rex’s brain was removed and placed into his current robotic form. Rex had been infected with a seed during his first stay in Dimension-X and now Deathseed has finally been able to return. He hopes to use the Absorbanoids to drain all of Earth’s resources, transforming it into a new Deathworld. He will then use the stolen energy to launch a conquest of all of reality through access points throughout Dimension-X. On the surface, Tierra Jones speaks about the recent death of Warren Terror, the villain having died at the hands of Malcolm in self-defense. Maxine points out that there was nothing really that Malcolm could have done differently. Tierra agrees but no longer believes that life dating a superhero is as exciting as it once was and she may have to move on. The Absorbanoids suddenly burst up through the ground and begin an invasion of Earth, causing the two girls to run for cover. The Rock House Diner is utterly destroyed by the Absorbanoids which causes Rock and Widow to battle the alien creatures. Zeek joins the fray, enraged that his friends’ diner has been destroyed and determined to avenge their loss. Daredevil and the Little Wise Guys soon arrive on the scene and they too join the fray. Meanwhile in the laboratory, Battle Girl manages to get a hold of the gun that the destroyed robot had wielded. She opens fire and guns down several of the Absorbanoids, releasing Malcolm from their grasp. Malcolm cuts off further invasion by destroying the portal to Dimension-X, trusting that Rex Dexter will find another route back to Earth. He takes a bit of wreckage to use as a weapon before the two heroes head to the surface to defend Chicago. Malcolm hurls a boulder through one of the Absorbanoids to save Tierra and she is relieved to see her boyfriend. The shuttle that Rex had taken from the alien world crash-lands on Glum World and is damaged beyond repair. Rex leads his wife and child in search of Mister Glum but it is not long before he has found them instead. The heroes brace themselves for trouble but Glum is actually pleased to see them. He asks that Rex help save the life of the recently injured Angel Dragon in return for safe passage back to Earth. Monster Rex is angered by the acts of the heroes against his forces and vents his frustration upon Malcolm. The young hero valiantly tries to fend off the resurrected Deathseed but is overpowered by his opponent. Monster Rex’s head is shot from afar as Rex Dexter announces his return finally. He explains that he has successfully saved Angel’s life which allowed him, Horridus and Dixie to be sent home. The remaining Absorbanoids should be easily dealt with now that their leader is dead. The victorious heroes gather together to assess the damage before they pick up the pieces and start anew. Vanguard receives a transmission from his homeworld of Kalyptus where his grandfather explains his anger over recent events. It has been months now since Vanguard was ordered to return home as their war with the Tyrrus Combine is now over. It is made clear that should he not return home immediately then a ship will be sent to apprehend him and return him to Kalyptus as a prisoner rather than a returning hero. After the conversation has ended, Roxanne Wells wonders if it would be so bad if Vanguard just states that he wishes to remain on Earth. Vanguard explains that this would cause his people to come here for sure and although they are the good guys in their war with the Tyrrus Combine, they would still cause problems for Earth. The planet’s abundance of natural resources could prompt the Kalyptans to take up permanent residence to exploit these resources. Roxanne gets upset with her boyfriend over the fact that part of his mission was to spy on her world and storms off away from Vanguard. 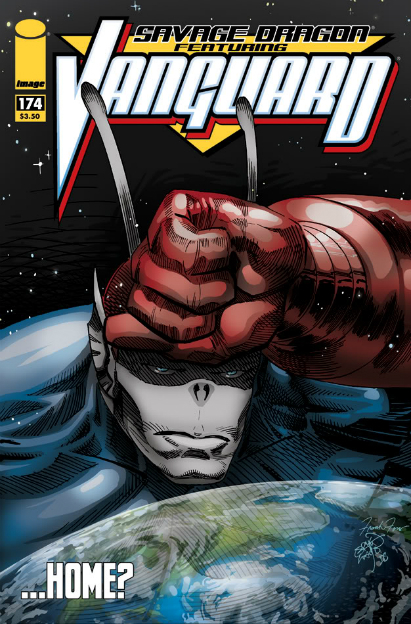 SuperPatriot suddenly appears before Vanguard in a fully human form and is enraged that he has been restored to his pre-cyborg form. It soon becomes clear that SuperPatriot is actually Lurch who has transformed into the hero so perfectly that his DNA is even scanned as the same by Wally. Lurch then takes on the form of Vanguard and is similarly convinced that he is the alien warrior before he is shut down. Vanguard suspects that Modem is responsible but Wally is quick to point out that she is being held prisoner in her original powerless form.